A few days ago, I decided I needed to make something that was easy to grab and eat or create a breakfast from in the morning. Eggs are a pretty big staple in our house as they are one of the main foods in Savy Baby's FPIES based diet. Personally, I love an egg sandwich, burrito, etc. in the morning, but I rarely seem to have the time to cook up a fresh egg before work. That leaves me either eating something that is less healthy like a bagel with cream cheese or buying a few $.99 wraps from Dunkin' Donuts (these are my big breakfast weakness to be honest). Since I already had ham, cheese and mini flour tortillas on hand, I figured it all I needed to do was make some eggs. Grease the muffin tin well. Since Savy Baby can only have olive oil, I used a small basting brush to brush olive oil all over the inside of the muffin tin holes (make sure to do the sides too). This technique is something that I find works well for all of my baking and eliminates the use of non-stick spray which is full of chemicals. Crack an egg into each hole. I use a butter knife to slightly break up the yolk so that it cooks all the way through for Savy Baby but you don't have to. It's up to you and the way your family likes your eggs. If you don't slightly scramble it, the yolk won't cook all the way through. Add salt (and any other spices like pepper/garlic, etc.) to the eggs. 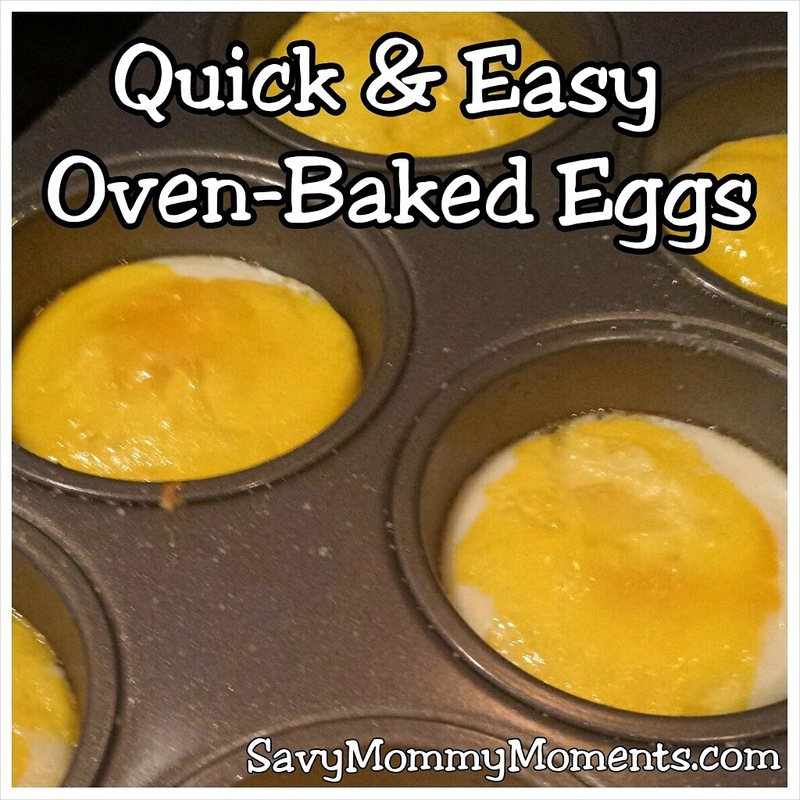 Bake at 350 degrees for 10-15 minutes, until the eggs look cooked. Let set for 5 or so minutes and then remove from the pan. You can serve these plain, on a sandwich, in a breakfast scramble, and many more ways. I stored the extras in a tightly sealed container in the refrigerator for the week. Hope you enjoy this quick and easy "recipe"! Feel free to share it with your family and friends!